Had a wonderful time at Karaun House. It’s an absolutely beautiful b&b with lovely rooms and located in a charming part of Ireland. Teresa was a warm and welcoming host and made delicious breakfasts each morning off a varied menu. I would absolutely recommend booking a stay here! Hem estat molt de gust a Karaun House, la recomanem al 100%. La Teresa ens va acollir molt bé i sobretot ens va fer uns esmorzars fantàstics. Tenint en compte que som celíacs, poder confiar en el que t'ofereixen i que a més el pa sigui fet a casa és tot un luxe. Les habitacions són molt confortables i es dorm sense cap soroll. Un descans ideal enmig de la natura i a poca distància en cotxe de Galway. Una bona elecció. We have really enjoyed our stay at Karaoun House. Teresa is lovable and helpful. She prepares delicious breakfasts, also for coeliacs with gluten-free homemade bread! Rooms are very comfortable, with no noise. An ideal rest in the midst of nature and just a short ride from Galway. Excellet choice. We recommend it. B&B accogliente, camera spaziosa, posizione ottima. Teresa persona deliziosa, disponibile e simpatica. Le sue colazioni ci hanno deliziato la giornata. Per mia figlia un sevizio senza glutine impeccabile. Grazie Teresa. Le summum de notre séjour en Irlande en termes de qualité d'hébergement taille/qualité de la chambre familiale et du petit déjeuner. Teresa a la délicatesse de présenter les hôtes entre eux au petit déjeuner, ce qui est beaucoup plus agréable et facilite les contacts. Véhicule quasi indispensable. Situation pratique pour visiter Galway et le Connemara, ou pour descendre au sud vers Bunratty Castle et le Burren. A peaceful place to stay, with very hospitable and helpful hosts, near small town with the essential amenities. Would happily return and recommend it to others. Everything was perfect. Terese and her husband Danny are absolutely wonderful. We will come back!!! Merci pour votre gentillesse, la chambre est grande et au calme nous avons pris la chambre pour 3 personnes. Le petit déjeuner est excellent. Very good B&B, lovely and friendly people.I Would recommend. The owners are really friendly. You will not want to leave. Spotlessly clean house with welcoming hosts. Sunset over Galway Bay is a short walk down the road. Close to Galway and Conomara. Delicious breakfasts. A great choice for any traveler looking for personal attention. We enjoyed our stay at your B&B very much. Thank you for a warm welcome and your recommendation for a meal at the seafood restaurant nearby. We'll be happy to come back again another time! Perfect and most charming hosts! We had a wonderful stay at Teresa and Denis' house. They do wonderful Irish breakfast or whatever suits you. Rooms are spacious and very comfortable, with even hot blankets...The rural location is very quiet, 5 minutes by foot from the coast. It is very well located to explore North, West or South Connemara. Nice restaurants around 5 minutes by car and very good advices from the hosts. We highly recommend! Very nice B&B. The room, the house, was perfect. Very good breakfast and Teresa and her husband were very nice. They introduced us to the other guests, gave us directions and recommendations to explore, information about golf courses, etc.. really kind. We've been in several B&B this summer and this is the best we've been in. Thanks!! We stayed here for our first night in Ireland and we could not have picked a better B&B! Everything with the room was perfect and clean, the internet worked well important for us as we needed driving directions for the next day!, it was close to the Cliffs of Mohr and within walking distance of an amazing seafood restaurant. The breakfast that Teresa cooked was hearty and delicious, I wish we could have stayed more than one night! A huge thank you to both Teresa and Denny for making our introduction to Ireland a most amazing one! We had a lovely stay here. We walked just a minute or two down the road to the sea that evening to walk the shoreline, she recommended a wonderful restaurant within a half mile of her home and breakfast was a treat next to her beautiful garden. All was what you would hope:quiet sleep, great shower, great breakfast, kind and helpful host and hostess. The location was nice for us in our trek between downtown Galway and the Cliffs of Mohr/Burren. Excellent. We were delighted with our stay. Lovely rooms in a lovely house. Extremely friendly and welcoming. Great breakfast. Overall a great stay and outstanding value. I would have no hesitation in returning or recommending Karaun House. Lovely room and location good for what we needed, Tasty breakfast in the morning! Es war ein wunderschöner Aufenthalt in diesem B&B. Die Gastgeber waren sehr freundlich und stehts hilfsbereit. Die Lage ist perfekt für Ausflüge nach Galway und Umgebung. Sehr gute Restaurants in der Nähe. Karaun B&B ist absolut zu empfehlen. 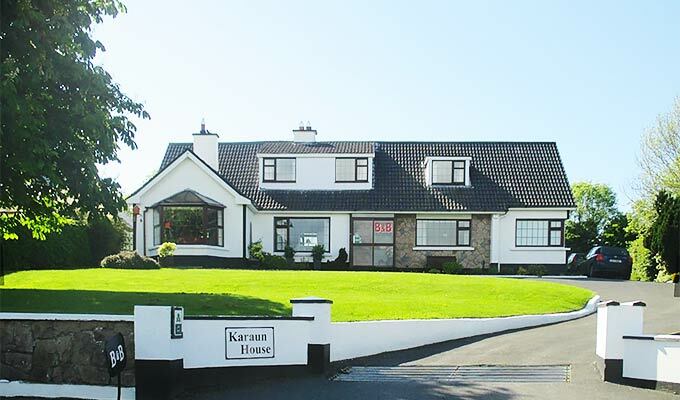 We stayed for 2 nights at Karaun House in July 2013 and were delighted with the accommodation. Our charming hostess Teresa looked after us very well, with huge Irish breakfasts and help with local tours. Our room was very comfortable, with views across the lovely front garden, and a spotless ensuite. The location was excellent, with easy access to Galway Bay, main road to Tralee, and to local beaches. Thank you Teresa and your husband for making our stay so enjoyable. Very nice B&B! Clean and pleasant room, full irish breakfast fabulous. Mrs Teresa is very pleasant and friendly! We felt like we were at home! Simply wonderful! Everything's just perfect, thx to Teresa! Teresa and Dinny were wonderful hosts. Their house is lovely and the area is beautiful and convenient. I especially appreciated the gluten free breakfast and special treat provided for me. I would definitely stay here again. This lovely b&b is the perfect place for coeliacs and their families! Theresa made delicious breakfasts for us all according to our needs besides glutenfree we also needed dairy-free food..... It was the first time I could really relax and take it easy without any worries. We were even able to eat out without problems because Theresa told us where to go: there are two restaurants that can offer great seafood and soups that are gluten free and the owners are very careful if you ask for gluten-free food. Theresa and her husband are very pleasant people and they make you feel at home as soon as you arrive. Karaun House was the wonderful start of an amazing holiday on the Irish west coast! Thank you, Theresa! The triple room is nice and clean, breakfast perfect. Teresa is a kind person with good advice for a restaurant and pleasant conversation. Something should be done to improve calm and silence in the evening. Our room was situated beside a common bathroom and the other people used it very late >10.30 -11 pm in the evening, making a lot of noise with the doors, water, speaking, loudly etc. The travellers should be asked to minimize noise after 10 or 10.30 pm. Those peolple also had a conversation together at that time late in the evening downstairs, but the acoustics of the house is such that the noise "get upstairs" and is was as those people were in our room because the doors are thin and the staircase is open. So this BandB would be better with some attention to reduce noise problems, at least in the evening. Excellent accueil , chaleureux et discret . Sourire, conseils de visites , bonnes adresses de restaurants dans les environs et conversations chaleureuse ,Teresa nous a donné l'impression d'être en famille! on a envie d'y revenir. Super petit déjeuner et excellentes chambres. We booked this B&B for breakfast gluten free options because i'm coeliac. We staied 2 nights and it was like being at home. Good place, delicious breakfast, wonderful host and Teresa gave us lots informations and suggestions about things to do and places to eat gluten free. Our recent stay at Karaun House B & B was excellent. The accommodation was very comfortable and spotless. The welcome from our hosts Theresa and Dennis, was warm and friendly and we felt very much at home. We hope to have the opportunity of staying at Karaun House again as it was a very enjoyable experience. A highly recommended b&b. A nice house in a good place at a reasonable price. We received a lot of attentions from Teresa and her husband. Teresa is a great chef and she is attentive and talkative. She is a person with an special energy that spreading over her house. We are very happy to have spent some holidays in her B&B. After we have visited more others B&B, we can tell that her full irish breakfast is the best we have tasted ever! We very much enjoyed our stay in this friendly, comfortable B&B. It was half the price of nearby hotels and I can't imagine that any of them would have provided half of the welcome. I'd have no hesitation in recommending Karaun House. We stayed at Karuan House for two nights and loved it. Teresa made us feel welcome and provided an excellent cooked breakfast. She also recommended Moran’s Oyster Cottage. I wish it was not so far away as I would love to eat there more often. If you are in Galway don’t miss either Karuan House or the Cottage - both are excellent. A brilliant 2 nights accommodation. A lovely house with lovely hosts. Teresa catered superbly for my coeliac diet providing an excellent full Irish breakfast totally gluten free - including her home made bread. Teresa was a great hostess. She made us feel very welcome and provided our daughter with all sorts of gluten free breads/cakes that she baked herself. She also recommended some excellent restaurants that were able to easily accommodate a gluten free diner. The house is in a quiet location. We enjoyed walking in the area. A very nice BB. Comfortable rooms, good breakfast fantastic for coeliacs and the owners very nice in all the aspects. Try it. Les chambres sont un peu vieillottes mais propres. Les hotes sont absolument charmants, tous les deux ; et le breakfast impeccable. En plus, ils ont un trÃ¨s joli jardin. Sehr schÃ¶ne Lage, nette Gastgeber und ein groÃŸartiges FrÃ¼hstÃ¼ck. Our Hosts were very nice people. The breakfast area was pretty with a beautiful garden view. The only drawback was our room was up a flight of open wooden stairs that could be very slippery and our room and bathroom were very small but clean. Mr. O'Dea insisted on carrying our bags up and down the stairs which was a plus. The location was central for our planned route which was good. It was a very warm welcome, the host is realy nice and generous with help, information and so on, the room with bathroom was very nice, clean and peacefull, the room where we had our breakfast was very comfi too. Breakfast was very good and I was given even a glutenfree full irish breakfast! Many thanks to them. We really liked to stay there. Nearby are very good pubs and restaurants where you get excellent glutenfree meals. This is a very comfortable place to stay. people there are very friendly. I would like to go there again when I am in Galway another time. Wanna feel like home even better Just go to Karaun. Everything you may need, Bridie would provide it, making your staying in Kerry the most charming and comfortable experience despite the weather... hehehe. 3 "hurras" to Bridie and her husband! What an amazing place! My wife, 7 month old, and I stayed at Karaun House for one night in late July! Teresa was amazing!!!!! Don't forget to have some delicious oysters at a local resturant when you go!!! !